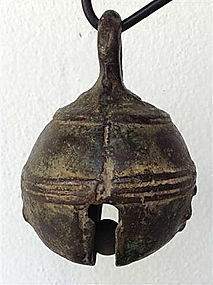 A rare genuine Thai antique Bronze Temple Bell. Has original clapper which produces beautiful sonorous sound! Natural aged bronze patina. Comes with an attractive custom made display stand. Good condition. Size excluding stand: H. 10 cm. x 7 cm. diameter. Shipping extra by EMS with a tracking number which we will quote once we have your address with postal zip code. A rare ca. 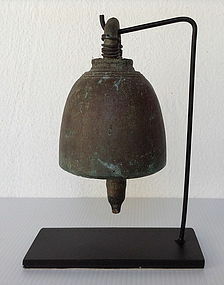 12th Century S-E Asian Bronze Bell from the Estate of Johan and Randi Daehlfeldt, Denmark. 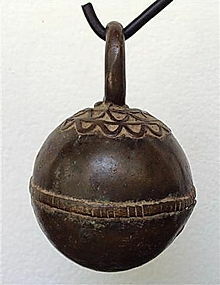 This bell is still sonorous and has a nice relief design on top. Beautiful naturally aged patina and comes with an attractive custom made stand. Some inconsequential wear due to considerable age. Size: H. 7 cm. including top loop x 4.5 cm. without the stand. 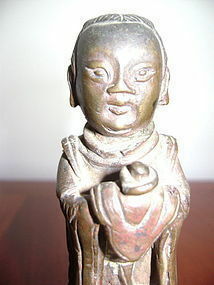 An attractive Ming Dynasty (1368-1644) Bronze Statuette of a TAOIST FEMALE DEITY holding an offering in flowing robes on a stylized lotus pedestal, Fine workmanship with many details. Natural aged dark patina. Overall condition good with a piece of the pedestal missing in the back (see photos # 5 and 6). Comes with an attractive display stand. Size: H. 4 3/4" x 2 1/4" x 2 1/4" (12 x 6 x 6 cm.). Rare find! 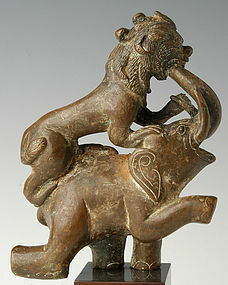 Mandalay BRONZE ELEPHANT & TIGER Statue 19th Cent. BRONZE BUDDHA & THE NAGA KING MUCALINDA 17/18thC. 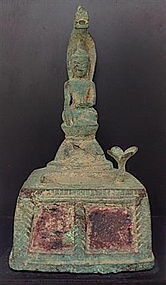 A fine bronze depicting "Buddha and The Naga King Mucalinda", 17-18th Century, Burma. Comes with an attractive custom made stand. Size: H. 14 cm. 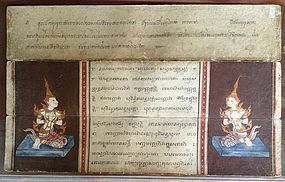 x 8.5 cm. excluding the stand. Rare collector's item. 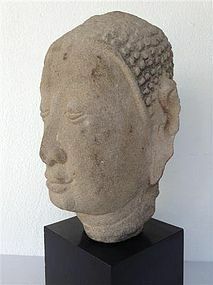 A genuine mounted Burmese red Sandstone Head of Bodhisattva, 17-18th Century. Good condition. Size: H. 18.5 cm. x W. 15 cm., excluding custom-made stand. Set of 5 graduated Bronze Opium Weights, early 19th Century, good condition, the largest measuring 3.5 cm high and the smallest 2 cm. high. Octagonal base. A fine set of 6 early 19th Century graduated Hamsa Duck Opium Weights from Burma, the largest 6.5 cm (2.5") high, the smallest 1.75 cm (3/8") high. Good condition, hexagonal base. 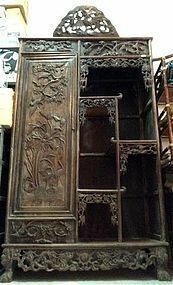 Chinese elaborately carved Rosewood Cabinet, 19th Cent. 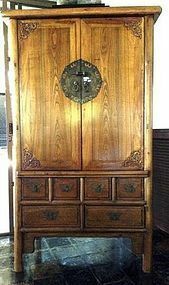 Beautifully carved Chinese Rosewood Armoire/Cabinet with door/closet and several sections for displaying art objects. 19th Century, heavy piece of furniture. Good condition, Size: H. 180 cm. x W.110 cm. x D. 44 cm. (71" x 43.5" x 17"). With a little work/touching up this can be a spectacular collector's piece! 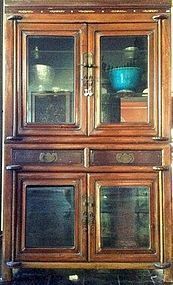 Attractive 2-piece Chinese wooden display cabinet with glass doors and fine inlay work (see photograph # 3 for details). 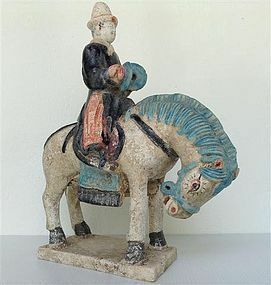 19th Century, good condition. Size: H. 169 cm. x W. 102 cm. 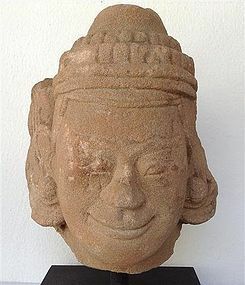 x D. 46 cm. ( 66.5" x 40" x 18"). A large Chinese Elm Wood Altar Table/Console with nice detailed carvings, 19th Century. Good condition, size: L. 243 cm. 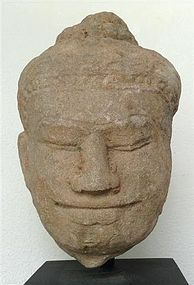 x H. 104.5 cm x D. 34 cm. (95.5" x 41" x 13.5").